A moisture barrier that prevents and helps heal skin from diaper rash, minor burns, cuts, allergic rashes, insect bites, perspiration, irritation, acne, prickly heat, wounds or fistula drainage, hemorroids, fungal infection, eczema, impetigo, and incontinence. Temporarily relieves skin discomforts and itching. Also sold per box (20 sachets). Cleanse skin gently with mild skin cleanser. Allow to air dry. 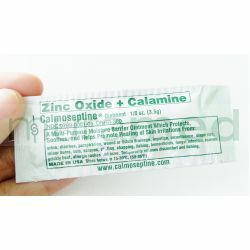 Apply a thin layer of ointment on the affected skin area 2 to 4 times daily. FOR EXTERNAL USE ONLY. Do not apply on deep or punctured wounds. Avoid contact with eyes. Keep out of children's reach. If condition worsens or does not improve within 7 days, consult your doctor. This product should not be used in patients with known hypersensitivity or allergy to any of its ingredients.